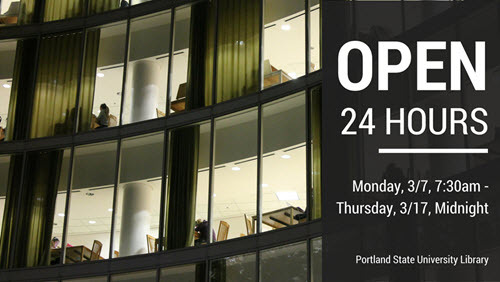 The Library will be open 24 hours for Dead Week and Finals Week from Monday, March 7 at 7:30 a.m. through Thursday, March 17 at midnight. Only PSU students, faculty, and staff may be in the Library overnight. After midnight, when the doors are locked, enter by scanning your white PSU ID Card (shown here) at the card reader by the ADA-accessible door. Don’t have a white ID card? Stop by ID Card Services in Neuberger Lobby. Campus Public Safety will walk you to your car or residence hall when they are available. Ask the Officer in the Library or call Dispatch at (503) 725-4407. College Housing Northwest (CHN) offers extended hours for their Goose Hollow Shuttle. Room 160, near the elevators on the 1st floor, will generally be open as extra study space. Please keep your valuables with you if you leave your desk or table! Return your books inside the Library, or use one of the two book drops outside. Good luck on finals, all! Find more information about Dead Week and Finals Week at PSU Library. See the complete Library schedule.